I completely agree with you that Staub is the winner hands down! My 10 year old Le Creuset pots are a mess. 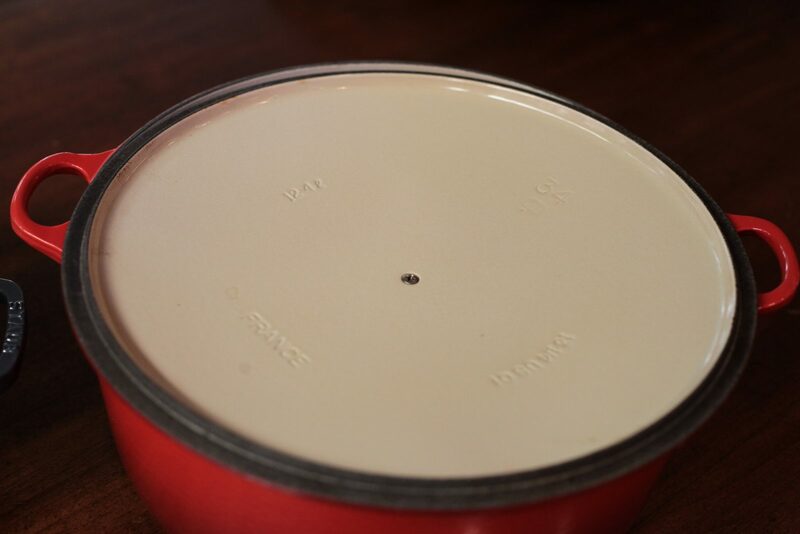 The enamel has worn off even on the lids! Furthermore, Le Creuset do not honour the lifetime warranty and my experience with Le Creuset customer service was such a turnoff that I took another look at Staub when I was shopping for replacement pots. They are far superior in every aspect. These are the pieces you hand down to your children, it’s obvious they are of superior quality to Le Creuset once you start working with them. 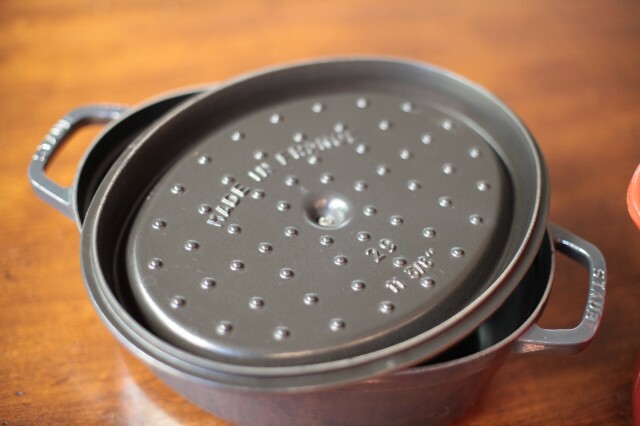 Staub gets better with use, Le Creuset just deteriorates with time (that’s my experience with an electric cooker anyway). Wow! 13-quart pots! 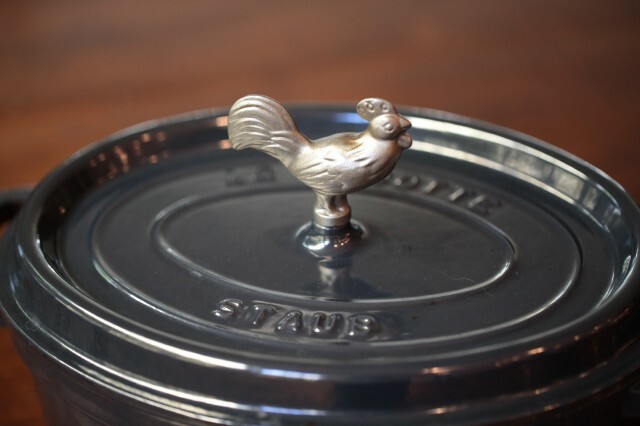 I have a Staub 5.5 round and a 7 oval, and handling them can be a workout. I can only imagine how heavy the 13-quart ones. Which one do you find more versatile though? The round one or oval? Oh dear Pilar! I am sorry I took so long to reply to you! Yes, I love my 13 quart pots! I love to cook for large gatherings and these beauties let me do just that! I don’t find much of a difference between the oval or round. If I am doing a large pork shoulder, for example, and I find that it is too long for my round pot, I simply cut it into two pieces. I think because they are both so large, they allow me a lot of versatility. 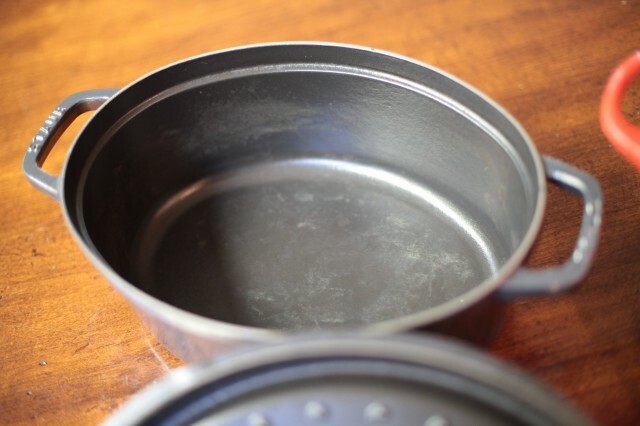 I also have a 4.5 quart Staub that I also love, but believe it or not… I use my 13 quart one much more! My 4.5 quart pot is an oval shape. Don’t you just love yours? Yes, they are very heavy but that only reminds me of just how amazing they are! Fall and winter is coming…… that means more dishes to make with these perfect pots! Great article! 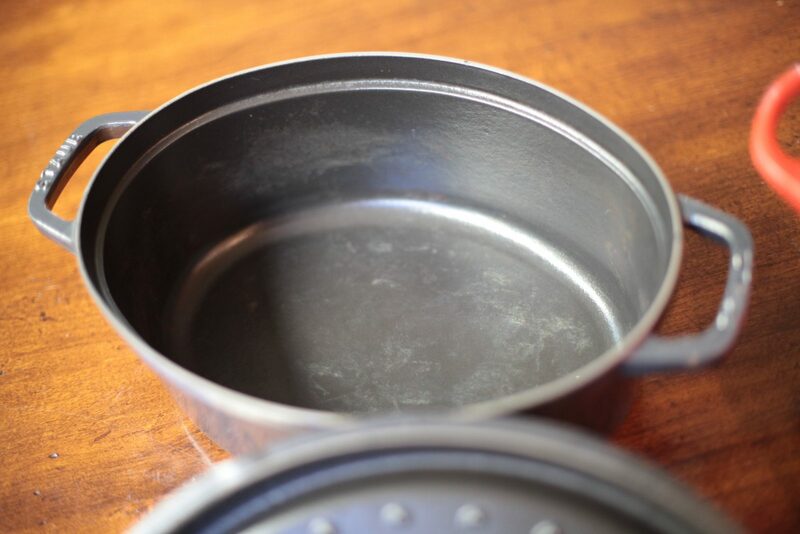 I was looking around for cast iron pans and stumbled up on your blog I just wanted to add that although you used the same recipe to compare the pans, the Le Creuset is a much, much bigger pan, which might also have an impact on the outcome of the dish. Hi Steven! Great observation! But I did do big batches of braised short rib in both pots and I still found the Staub to be superior in performance to the Le Crueset. The dimples on the bottom of the lid does seem to make a difference. I hope you found one you like! Regarding where the pots are made “They are both made in France”. LC is now made in China. Look at the box. That is very sad to hear Elizabeth as their site states that their products are still produced in the French town Fresnoy Le Grand. 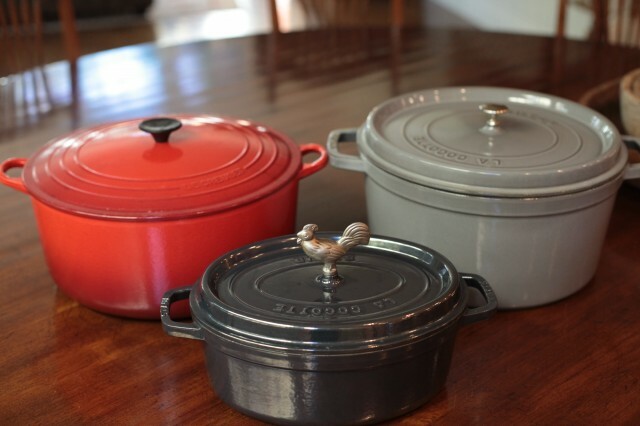 For the record, all Le Creuset cast iron items (skillets/braisers/dutch ovens) are produced in France. Their accessories and enameled ceramic/stone bakeware is produced in Thailand and/or China depending on the piece. 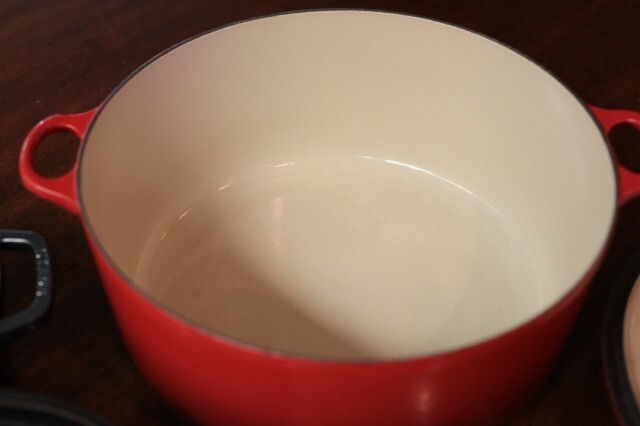 No, the enameled cast iron Le Creuset products are still made in France. It’s their stock pots and some ceramic items that are made in China. They also have a stainless steel line now. I’m not sure where those are made, but I can vouch for their quality, having used them several times when I took cooking classes. As for dutch ovens, yes, Staub wins hands down. That is untrue. LC is still made in France. The Stone/Pottery is manufactured in China. Same with Staub.